It’s that time again! As we reach the middle of summer (how is time going by so fast?!) BC interior peaches are now in season! (Available at your local road side produce stand) I gotta say, these peaches are my favourite because they are sturdy enough to handle grilling, yet still amazingly juicy with the perfect texture. They’re a perfect complement to a summer entre or as a simple yet delicious dessert (check out the Grilled Peaches dessert I posted). 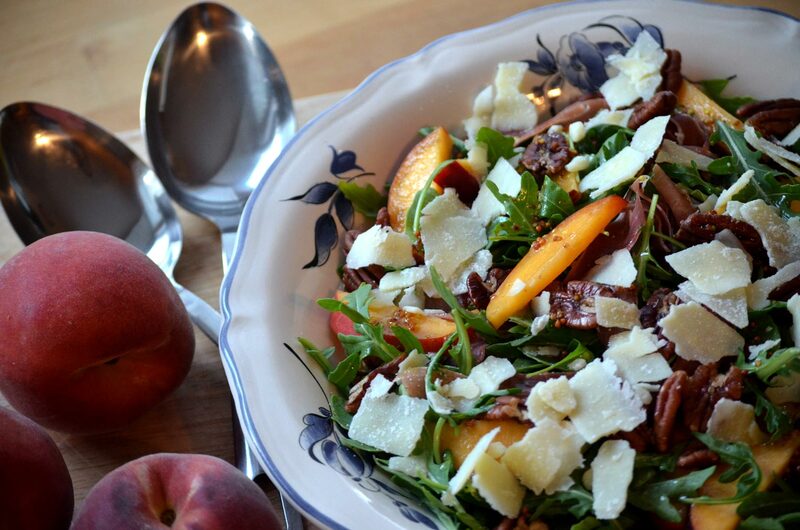 One of the many versatile uses for summer peaches is in a delicious salad! This salad is nice and light, and the grilling just makes the salad taste BBQ hearty while still being summer light and delicious. *Try and use firm, yet ripe peaches in order for them to stand up to the grill and prevent them from becoming mushy. Preheat a cast iron skillet on the barbeque on medium-high heat. Once the pan is hot, add the pecans and toss lightly in the pan, every 20 seconds for about 2-3 mins. Remove the pan from the heat and set the pecans aside. Meanwhile, in a small bowl, combine the ingredients for the dressing. Whisk to combine and set aside. Brush the cut peach halves with oil and place cut side down on the warm grill. Let peaches sear and flip once grill marks appear, about 2-3 mins. Continue to grill for another 3-4 mins until peach is slightly tender (You’ll see some juices coming out of the pieces). Remove from the grill and let cool. Once cool to the touch, thinly slice. In a large bowl, combine all of the salad ingredients, leaving about 1/8 cup of parmesan reserved. Toss to mix. Drizzle the salad with the dressing and toss to coat. Sprinkle reserved parmesan over the salad.